There has been considerable and worthwhile coverage of ‘Building Bridges‘ – The Sunday Hour interview with The Prince of Wales on the subject of Islamic extremism, radicalisation and the persecution of Christians in the Middle East. The same interview formed the core of Songs of Praise yesterday, part of which came from Highgrove. His essential purpose, he explained, is to show concern, sympathy and understanding to the individuals and families of those who have been killed, persecuted, made homeless or otherwise devastated by the abomination of desolation which is sweeping throughout the crescent-glorying world. He weeps with those who weep. Of course, he wishes he could do more, but by visiting churches and listening to people’s stories, he can at least draw attention to their plight and show them that they are not forgotten. Their suffering does not stop with the news cameras leave. Here at Lambeth Palace we should remind ourselves of the significant position of the Church of England in our nation’s life. The concept of our established Church is occasionally misunderstood and, I believe, commonly under-appreciated. Its role is not to defend Anglicanism to the exclusion of other religions. Instead, the Church has a duty to protect the free practice of all faiths in this country. It certainly provides an identity and spiritual dimension for its own many adherents. But also, gently and assuredly, the Church of England has created an environment for other faith communities and indeed people of no faith to live freely. Woven into the fabric of this country, the Church has helped to build a better society – more and more in active co-operation for the common good with those of other faiths. Some may quibble with “gently and assuredly”, and no doubt adduce the disturbing testimony of a few horse-whipped Methodists from the 18th century, or sundry alternative oppressions meted from time to time by the Anglican hegemony. And others will find in these words a hopeless capitulation to multiculturalism or a slide into religious relativism, if not a multifaith mish-mash in supposed contravention of the Coronation Oath. But neither the Queen’s speech nor the words of Prince Charles represent anything but an assertion of fundamental Anglican identity and an exposition of the traditional Protestant understanding of salvation. The Church’s identity may be the State’s reification of metaphysical truth, but it is one which coheres with the English psyche. Communities are not created or sustained by Christian coercion, but by nurture and love. We preach the gospel in season and out, but we live a life of service, humility and love. Without the latter, the former is a noisy gong or a clanging cymbal. Unless you acknowledge the “general value” of faith, you cannot understand the fundamental identity of many millions of Britons, or begin to grasp their framework of social action and belonging. As the Queen says: “..religious groups have a proud track record of helping those in the greatest need, including the sick, the elderly, the lonely and the disadvantaged. They remind us of the responsibilities we have beyond ourselves.” This is the essence of loving one’s neighbour. It is a human vocation performed and sustained historically in England “with the assurance of the protection of our established Church”. As has been frequently observed, there is no definite article in Fidei Defensor, principally because there are no articles in Latin at all (and here is not the place to quibble over Alexander Lenard’s translation of AA Milne to bequeath Winnie Ille Pu). When translating from Latin to English, the student must consider context, sense and reason to determine whether ‘the’ or ‘a’ is most appropriate. In the case of Fidei Defensor, the religious context, historical record and constitutional law leave no doubt. Henry VIII was granted the title by Pope Leo X in 1521, in recognition of his scholarly apologetic Assertio Septem Sacramentorum (‘Defence of the Seven Sacraments’) against the Protestant teachings of Martin Luther. The Faith was that of the One Holy Catholic and Apostolic Church: the book constituted the ‘Henrican Affirmation’ of inter alia the sacrament of marriage and papal supremacy. After the Reformation and Henry’s excommunication, the title was revoked by papal decree. It was bestowed again upon King Edward VI by Parliament in 1544, and has ever since been the title of the Monarch as Supreme Governor of the Church of England. For 471 years, there has been no doubt that Fidei Defensor is the guardian of the Protestant Faith. It is not possible to defend generalised faith when those faiths represent a plurality of mutually-exclusive theological propositions and conflicting dogmata. But it is ecclesially possible and entirely theologically coherent to be simultaneously Defender of the Faith and protector of faiths: the latter role involves general exhortation; the former a particular mission. It is missiologically possible to defend the Protestant freedom to believe (or not) as the individual wishes, while making them aware of the uniqueness and “particular mission” of Christianity. 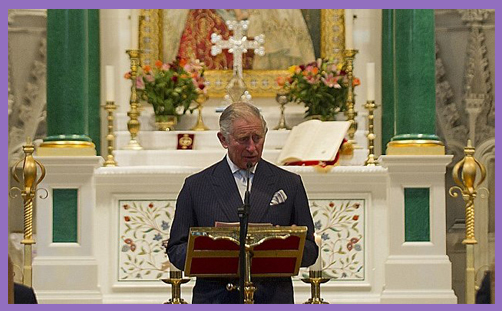 So when, by the Grace of God, Prince Charles swears the Coronation Oath, it will be upon the Holy Bible; not the Qur’an, the Guru Granth Sahib or the Bhagavad Gita. When he is anointed with holy oil, it will poured out by the Archbishop of Canterbury, with leaders of other faiths no doubt paying homage. When he is crowned King, he will, God willing, fulfil his spiritual vocation to “maintain the Laws of God and the true profession of the Gospel, maintain the Protestant Reformed Religion established by law and maintain and reserve inviolably the settlement of the Church of England”. Of course, whether a metaphysically neutral Parliament permits him to keep his Oath remains to be seen.